Updated 22 July to add a link to the prize page. Back in Normandy, I promised to knit my step-mother-in-law a pair of socks. She chose the pattern and the color: red. I don't know if she'd like variegated yarn or on which side of the pool debate she'd fall, but the red seemed stronger than the bits and pieces of dark colors in this skein. On the record: I don't care for pooling, but I can tolerate small amounts. However, these pools of really dark blue and green look like bruises. Could you imagine how skeeved you'd be if one of your tomatoes had marks like that? And anyway, the stitch pattern and the variegation no worky. 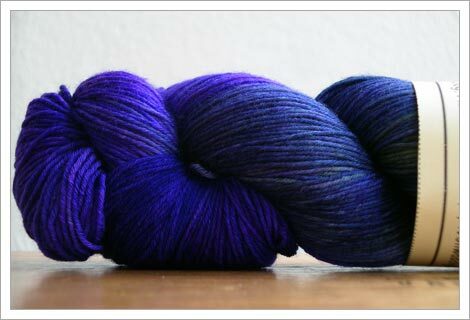 Not only is it time to buy another yarn for her socks, but it's also time to dip into the Wollmeise. 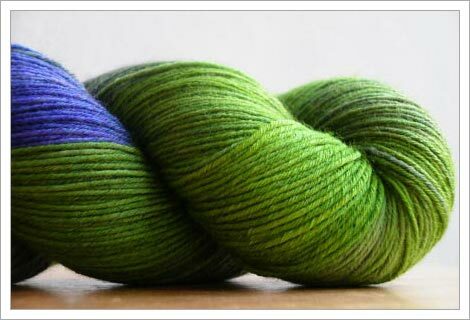 There's a lot of buzz swarming around this yarn, probably because it's the first notable indie yarn in Europe. 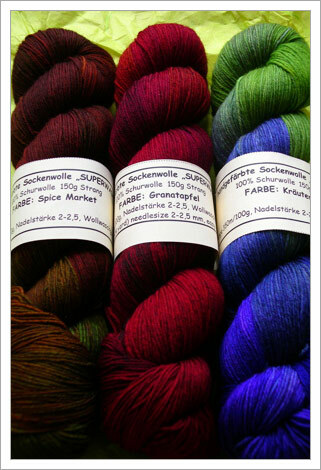 There are more than 100 skeins of Wollmeise stashed in Ravelry -- pretty amazing since there's no shopping cart on Claudia's Web site. You order via email. I made first contact this morning, and there's something in it for a lucky one of you. Here's the deal. I have been spending way too much time on the interweb (no thanks to the new Ravelry groups), and not enough time cranking through my summer knitting goals. 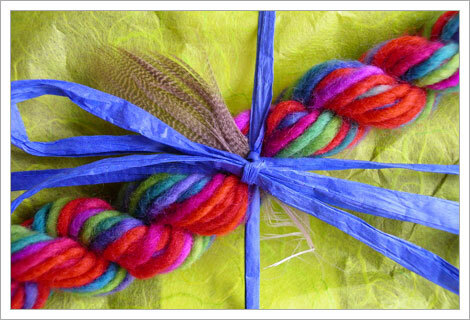 This Tapis Colinette Jitterbug needs a pattern, a pool-defying pattern. I can't possibly go it alone. Here's where you come in. 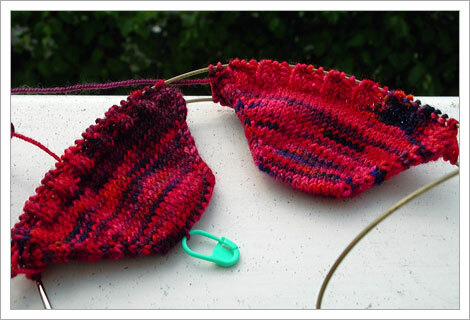 Send me an email (knittingsutra AT gmail DOT com Subject: Contest) with a link or citation to your favorite pool-defying sock pattern, and I'll put your name in a drawing for a prize. If you mention this contest on your blog (post a link in the comments), I'll add you to the pool a second time. For each participating person who says he or she heard about the contest from your blog, you'll get another chance to win. Deadline for entries: July 31, 2007, 6:00PM EST (that's midnight my time). Obviously there's no way to absolutely prevent the pool, but the pattern has to do a pretty good job of it. If possible, your links should include photos so I can verify. For patterns from books, see if you can find a photo in Flickr or Ravelry. You cannot suggest Monkey Socks because its pool-blocking properties are well-known. It's OK if you think the pattern combats the pool of a specific yarn, and it doesn't have to be Jitterbug. Since submissions are anonymous, people can submit the same pattern. 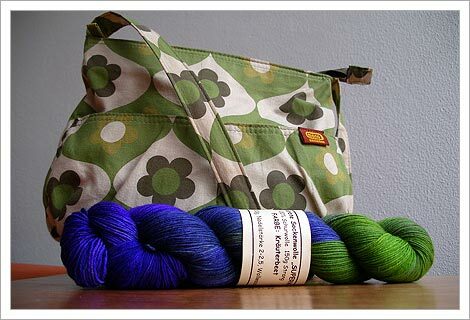 The prize is a skein of 4ply superwash Wollmeise sock yarn and a small casual bag from Mono Amsterdam in your choice of fabric. Mono Amsterdam bags are sold in a teeny shop in the Jordaan, the hippest neighborhood in Amsterdam. The store is so small that they only accept cash. So this is a very exclusive bag, and you'll get the pleasure of knowing that I'm going to slink up to Amsterdam to get it just for you. I will also throw in some surprise Dutch goodies. I'll make it all good, I promise. Head on over to the prize page for the prize pr0n.